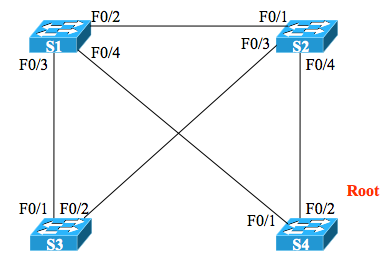 Here’s another Spanning Tree question, one that creates a topology in which one switch does not have a direct link to the root. What happens in this case? Note that as with this similar question, this question is meant for study prep, not for assessment, so don’t worry about how much time it takes, or fret if you get it wrong – just use it to learn. In the switched network shown in the figure, the switches use PVST+, which creates an STP instance per VLAN. 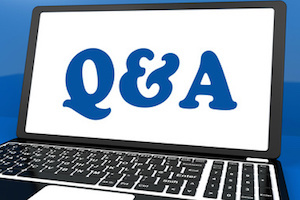 This question focuses on the STP state in VLAN 2. Currently, switch S4 is the root. Continuing with the conditions and assumptions… there are no other devices or links in the network. All the links physically work and are enabled (no shutdown). All the links use 802.1Q trunking. The switches do not necessarily use all default STP settings. The point here is that, with switch S4 as the root, which STP settings in this network could impacts S3’s choice of root port. To choose its root port, switch S3 will compare all received Hello BPDUs, and choose the best (least cost) path to reach the root. Think about all the switches, interfaces, and port priority settings. Which of those settings (as listed in the answers) could impact S3’s choice of root port here in VLAN 2? I think in a defoult configuration the best path is from S1’s F0/3 int and S4’s F0/1 int, so to change the topology The only answer is to change the prority of S2’s F0/3 int. The root port for S3 is a choice between f0/2 and f0/3. The lowest cost route would determine the root port. Changing S1 F0/4 interface cost and changing S2 F0/3 port priority do not give the same result. Clearly changing S1 F0/4 interface cost makes it the lowest cost route. Why is S2 F0/1 considered in this? If S1 already picked its own root port as F0/4 and then lost the tie breaker (assuming default values) on F0/2 therefore blocking on that port. The question asks, paraphrased: which port settings “could” impact the choices? S2 has three possible paths to the known root, so the cost settings on all interfaces in all three paths “could” impact the choice. I think you analyzed what “is” in this specific case. So, picky wording on my part probably. Got it, I think I am thinking too much inside the box vs outside the box. Thanks for the reply. No problem. Maybe I should put a generic reach me page up. Or maybe I’ll just delete your comment and my response once we’re done. Clicking in “200-105 (New) Chapters”? That’s just the page that’s shown if there are no posts in that category. That is, I haven’t added a post that is specific to ICND2 chapter 5. If that’s what you’re seeing, it’s normal. If it’s something else, and you want to take the time to describe it here, I’ll take a look. Thanks! That is the same thing I am seeing. It wasn’t specific in saying there was no labs for Chapter 5, I assumed the page link was broken. Thanks.